Inside-forward Franco Louis D’Cruz was not only an unsung hero of the 1975 World Cup hockey team who finished fourth in Kuala Lumpur, but had to adhere to unkind remarks from a radio commentator. But, Franco who turned 68 on Nov 22, was the unruffled by the adverse comments nor being a low key player. Recalled from Australia to where he had left for in 1973, Franco was only too happy to have been an opportunity to ply in the World Cup on home soil and was determined to make an impact. 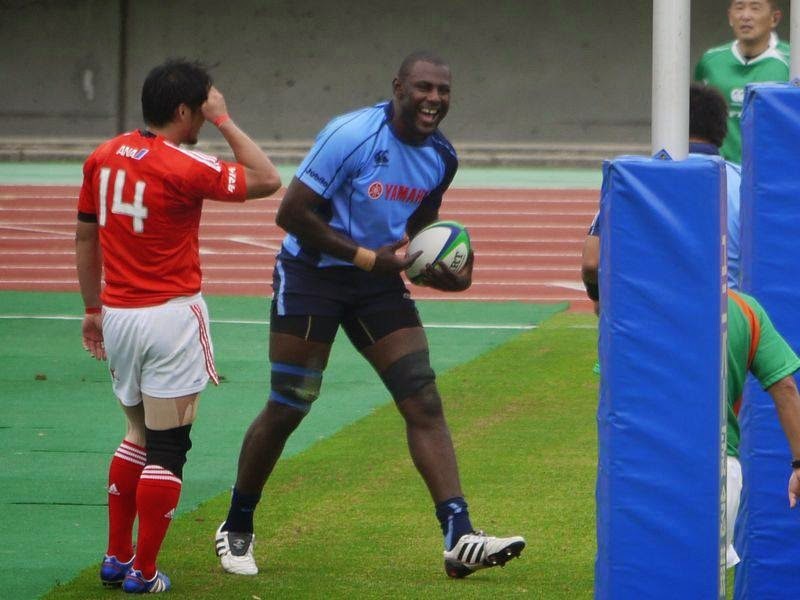 The other player recalled from overseas was A. Francis from Germany. While he was welcomed by his own players, he however had to bear with unfair comments from the radio commentator who said that he was pulling his weight when playing against European teams. Malaysia were grouped together with New Zealand whom they drew 0-0, Spain (0-0), beat Poland (3-1), lost to Pakistan (3-1) and beat defending champions Holland (2-1) to qualify for the semifinals to play India. “When I was told by my teammates that this commentator was taking me to task for not giving my best against European teams, I was very hurt because I gave everything in every game,” recalled Franco. “It is my nature that when I step onto the pitch, I give nothing short of my best. “But I told myself that I am not going to be disturbed by a commentator’s opinion which he was entitled although unfair. I just told myself that I will let my performance on the field speak for itself,” said Franco who started in the XI in all matches Malaysia played. Franco said it would have been even greater if Malaysia had qualified for the final which was only minutes when India equalised with even minutes to go and beat us in extratime 2-1. “I sincerely believed that we had the material to beat India and make the final, but it was not to be. “We had a fantastic team who were well prepared especially having gone for the month long European tour prior to the World Cup. Franco recalled the morning after the semifinals when one of the Indian players walked up to him and said that he had just come back from the temple thanking God for being kind to them in beating us. Franco singled out goalkeeper Khairuddin Zainal as the unsung hero of the team. “Khairuddin had only one job to do – keep his slate clean – and he did it well to help us qualify for the semifinals. He indeed did a tremendous job,” said Franco in paying tribute to Khairuudin. On his most memorable moment in his hockey career, Franco without hesitation said it was when Malaysia beat Holland to qualify for the semifinals. “For that match we played like possessed men. I can still remember how we prepared for the match. We were in total concentration, each one preparing and psyching ourselves for the match. Nobody spoke to each other from the time we got up in the morning for the match. We did not utter word at breakfast or even in the bus on the way to the Kilat pitch. On his biggest disappointment he said it was losing to India in the semifinals and then to Germany. “We could have finished second. In fact, if we had qualified for the final, I believe that we could have even given Pakistan a run for the money. 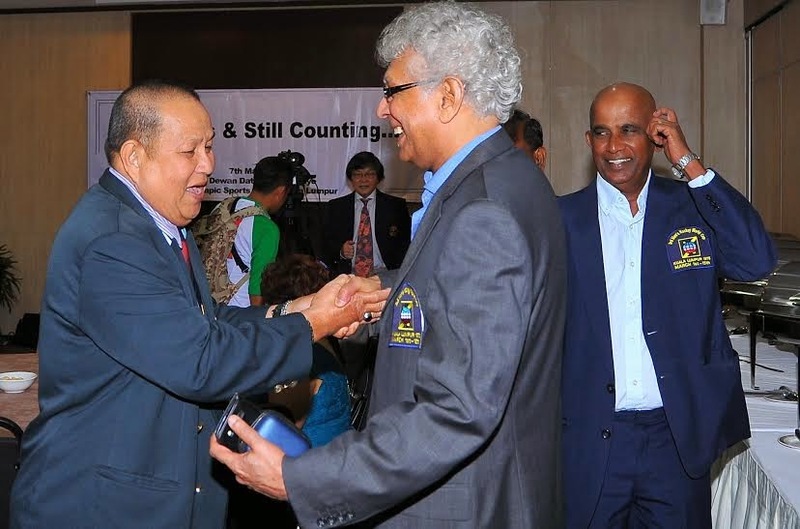 Franco was in Malaysia recently to attend the 40 years anniversary get-together of the 1975 World Cup team. He now resides in London where he moved in 1989 on job transfer from Melbourne but has since retired. On his move to Sydney in 1973, Franco said he has no regrets. “Looking back, I do not know if I would have achieved in life what I had by moving to Sydney. 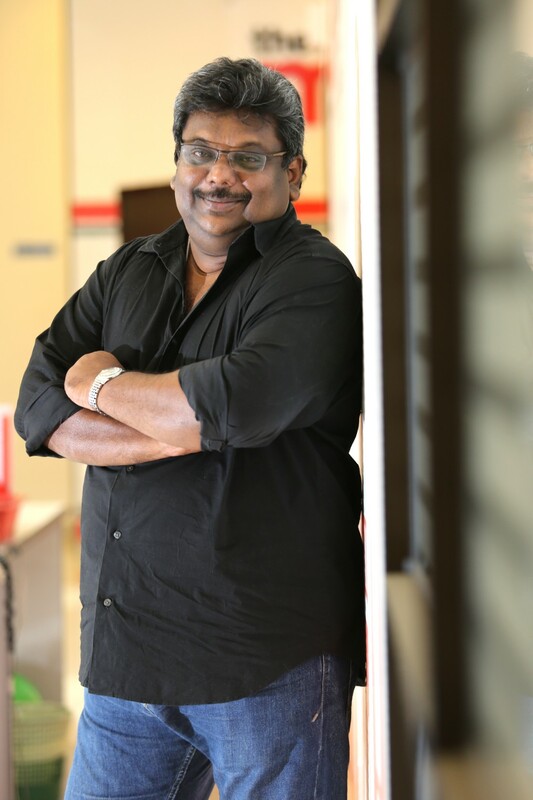 The move gave me a career in finance,” said Franco. 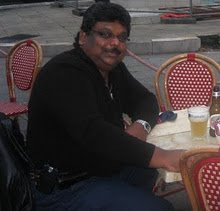 “As far as the game is concerned, I missed out on the 1976 Montreal Olympics as I had secured job after my return from the 1975 World Cup and my employers were not prepared to give me time-off to return to Malaysia. But Franco consoled himself by saying that he had tasted Olympics in Munich in 1972 after being dropped from the 1968 Mexico Olympics. Franco first earned his national call-up in 1966 for the Bangkok Asian Games but did not make the squad. He has been with the national squad since 969 and played in the 1970 Asian Games in Bangkok, the 1973 World Cup in Holland. Franco passion for hockey started at a very young age when he was given a hockey stick as a present when he was six. He broke the stick the very first day and had to settle for a hockey stick made from the ‘jambu tree’ for a while before he got another. He owes his prowess to the game to former national player and coach Lawrence van Huizen who was coaching at St Paul’s Institution. “We grew up in Seremban admiring players from Seremban like M. Joseph, Lawrence, Peter van Huizen and Henry sta Maria to name a few. “And to have Lawrence coaching us was like a dream come true. He was my mentor and it was the discipline he instilled in me that took me high up in the game. Fanco besides playing for his alma mater, represented the top club in Seremban those days – Rangers – coached by Lawrence too, went on to play for the State before donning national colours. In 1967 he joined the Police force as a civilian administration clerk and played for them before moving to Australia in 1973. Police at that time had seven players from the team playing for the national team. When he was in Australia, he played for club teams like Moorbank Liverpool, then the New South Wales state team, and as the only Asian player with Powerhouse in the Victorian League who were champions for four consecutive years. Currently, Franco plays with the veterans in London, but spends most of his time with his five grandchildren and his four daughters Cherylanne, Tracyanne, Leanne and Nastasha. On the current set of players in Malaysia he said that although he does not know much, but he sees them as a talented lot and with passion, determination and discipline, he believes Malaysia hockey is destined for better times. Sport associations have to buck up to be managed by creditable officials, be transparent, administer their association professionally and above have the interest of sports and their athletes at heart. For far too long now we continuously hear of horror stories of how annual general meetings are conducting, blatantly disregarding the constitution of their respective associations, officials running the association at their whims and fancies and more often than not for their own benefit. But a recent separate conversation with Olympic Council of Malaysia president with Tunku Tan Sri Imran Tuanku Ja'afar and newly appointed Sports Commissioner of Malaysia, Datuk Zaiton Othman, gave hope that the ills of Malaysian sports especially with the management of associations could well be a thing of the past. Both spoke about how sports associations have to stand on their own feet and above all be creditable and run their bodies in a professional manner. Tunku Imran said it is about time that sports associations are held accountable for the ills of their respective sports. For that to happen, he said the respective sports associations should take full charge of their sports and not depend the government, namely the National Sports Council (NSC) or the National Sports Institute (NSI). He said that both NSC and ISN are there to supplement the associations and not to do the work of sports associations. Sports associations have to get rid of the mentality to depend solely on the government to fund their training programmes and in some cases even worse – conduct the programme for them. He said that the respective sports associations are the experts in their sports and NSC cannot be in charge of all the sports. Tunku Imran said for associations to start playing the lead role, they have to start managing their associations professionally and for starters start looking or funds to conduct their programmes. Emphasis on development must be a priority of all associations, he said. “It will be a long and tireless process to get their act together, but they have to start immediately if they love their respective sports and want to see it do well,” said Tunku to me recently. Indeed, it is about time the sports associations stop having the dole mentality and be independent and professional. It is a tall order and probably going to take time to change the scenario, but it has to start somewhere and it must be now. Zaiton, on the other hand, spoke of sports associations having the right officials to manage their respective sports. She spoke about officials who have over stayed in the association, run out of ideas or still stay in the associations for their own benefit. Then she spoke about officials who are not fit to hold office and are a deterrent to the development of the respective sports. Zaiton spoke about how the Sports Commission wants to play a bigger role by vetting officials who intend to stand for office in sports associations. “We have had in the past officials who are bankrupt or bad track records helming associations or are key officials,” she said. Zaiton said that she has already made known of her intention of vetting officials who want to stand for election to the sports minister and he was supportive of the idea. 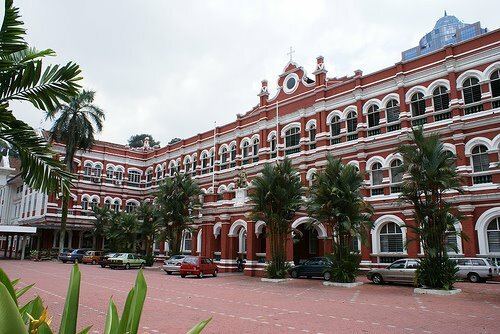 There is a national association whose technical committee was headed by a Datuk, but he was just a general worker in a school. He was also the honorary secretary at the state association who had never conducted proper Annual General meeting for his association. He was even appointed Technical delegate for the sport at two Malaysia Games and never produced a report at the end of the Games. Anybody with interest can come forward to assist their respective sports, but they must be knowledgeable and able to perform their duties and not sit in positions because of whom they know. Clique system in sports associations must be eradicated once and for all. Many sports officials want to stay in sports associations because of the benefit they like going for trips. Some of these officials do not even know the rules of their own sports. They hardly assist in bringing funds to the association. It is indeed a crying shame to see many associations do not even know how to conduct a proper annual general meeting and get into trouble when disgruntled affiliates or officials complain to the authorities. Many associations place high interest on their officials rather than the athletes. The argument that there will be no officials if there are no athletes or no athletes if there are no officials can go on until the cows come home. But its common knowledge that they both need each other. However, it will be benefit the sports better if we have more past sportsmen and women of their respective sports return to their sports to serve as officials. At least these past athletes will have better knowledge of the sports and know what the shortcomings of their respective sports are and address it. Will this dream situation where sports is managed by people who knowledgeable of the sports manage their associations become a reality soon? It is indeed a million ringgit question because there are officials who will do everything possible for a good thing to happen to sports and put it in the right path because it will jeopardise their stronghold in associations. But for the love and development of sports in the country, something drastic has to be done to out things right and it must happen now before the rot sinks further in and becomes a cancerous situation. What is sports in Malaysia coming to? Indeed, news from Kuantan that five shots were fired at the home of Pahang skipper Razman Roslan past midnight on Wednesday has put Malaysian sports in a bad light. The year began with Malaysian Athletic Federation (MAF) vice -resident Datuk Noorul Ariffin Abdul Majid being shot at by an unidentified man at his home in Bandar Rahman Putra, Sungai Buloh. Two bullets hit him in one of his legs. It was reported that Noorul had received a threatening letter about a month ago. Violence in sports usually refers to physical acts committed in contact sports beyond what is normal. These acts of violence can include attempts by a player or coach to injure another player or spectators threatening players or coaches with physical harm or actual harming them. In the past, we have heard of a football goalkeeper from the north finding a cobra on the driver’s seat of his car after a training session. Another player in the south was attacked and hit on the leg with bats near the hotel the team was staying before an evening match, forcing him to sit it out. His girlfriend then now wife was with him but was unharmed. Then, there was a foreign hockey coach who found a bullet in his car and a sports journalist who received a bullet by post. Internationally, who can forget the murder of Columbian Andrés Escobar Saldar after a 1994 FIFA World Cup match, reportedly as punishment for having scored an own goal that contributed to the team's elimination from the tournament. In Malaysia, several incidents of players being threatened by unknown persons have gone unreported. And always, public reaction was that betting or match-fixing was involved. But this has never been proved and these incidents remain a mystery. In the case of Razman, it would be unfair to even suggest that there was betting or match-fixing because he is an exemplary player known for his discipline. The Kajang boy is humble and well liked, although sometimes he speaks his mind. So, let us leave it to the police to do their investigation, solve the case and free Razman of any accusation. It is sad that sports in Malaysia has come down so low. What happened to fair play and sportsmanship? The truth remains that wherever there is betting, there is match-rigging. For this reason, the police, FA of Malaysia (FAM), state FAs and clubs must be alert to what is happening around them and not let down their guard. The authorities will not admit it but match-fixing is still happening, although probably not as rampantly as in the past. Although insinuations of match fixing have been bandied around for a long time now, Malaysian football has become synonymous with match fixing since 1994, when 21 players and coaches were sacked, 58 players suspended and 126 players questioned for corruption. In 2012, FAM suspended 18 President Cup players and banned a former Negeri Sembilan coach for life after they were found guilty of fixing matches. Last year, five Kuala Lumpur players and three officials were slapped with life bans and 17 others were fined after FAM found them guilty of match-fixing. A few months before that scandal, the Perak FA suspended its entire team for two weeks on suspicion of match-fixing after they lost heavily in several matches. The Pahang incident may not have anything to do with match-fixing, but it is a timely wake-up call for the authorities to continue their vigilance and not take their eyes off the road. As for Razman, it is hoped that he puts this episode behind him and returns to the game as soon as possible. He is made of sterner stuff, surely. Certainly, Pahang FA president Tengku Abdullah Sultan Ahmad Shah would not have found the incident amusing. He has been working very hard to build a formidable team, working up from the grassroots, and has achieved considerable success lately. He is definitely not going to let anything derail the progress of his team. Veteran motor racing driver Eric Ooi @ Azhari Ooi Abdullah will be turning 81 on August 17, but he does not look a day older than 60 years-old. Looking trim, fit and charming as ever, the Caucasian looking Ooi said he owes his long live and good health to his racing days. And on his Caucasian look, he said he was from through bred Chinese family. “It is just that my mother comes from Shandong in China where the people are much fairer,” said Ooi of his Caucasian complex. “I must really thank my racing days where I was very disciplined and focussed in racing,” said Ooi who was among the pioneers in motor racing having started racing in Singapore as a privateer in 1959 before moving to Malaysian in 1963. “I used to cycle 10 miles every day and gave up smoking when I used to smoke three packets a day. “My light weight also helped me in the race as the car was lighter. His first car was a Conco MGT which he brought from the money his mother gave him. But his love for speed saw him sell car and buy a TR2 which he modified and raced at the Thompson circuit in Singapore. Ooi fast gained a name for himself known for his tactical skills in racing, and for being a very fast and good driver. His reputation saw him lured by Volvo to their team which had experienced drivers like Rodney Siow and Philip Siow. But it was only a matter of time before Ooi became the top driver driving the B18s. In the later years when he moved to Malaysia he was driving Toyota before switching to the Datsuns. Besides racing in Johor in the early days, most of his time was spent racing in the Kenny Hill circuits. 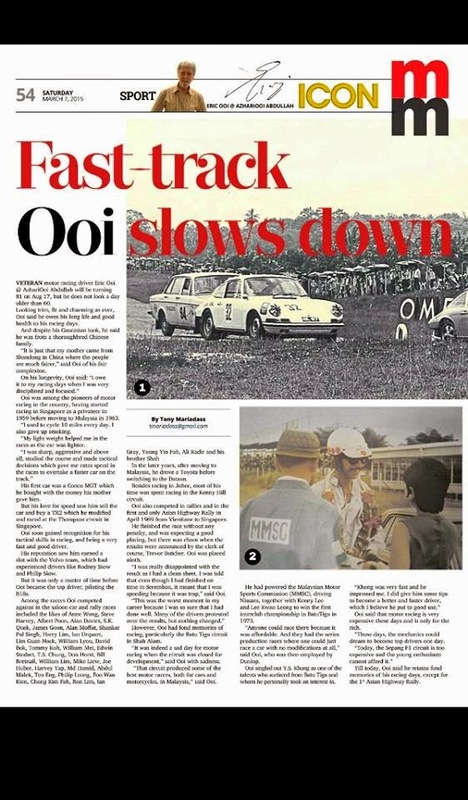 Ooi also competed in rallies and competed in the first and only Asian Highway Rally in April 1969 from Vientiane to Singapore. He finished the race without any penalty, and was expecting a good placing, but there was chaos when the results was announced at the clerk of course, Trevor Butcher, Ooi was placed ninth. “I was really disappointed with the result as I had a clean sheet. Then I was told that when I had finished on time at Seremban, it meant that I was speeding because it was trap,” said Ooi. “This has to be my worst moment in my career because I was so sure that that I had done well only to be robbed of a better placing. Many of the drivers all protested too over the results, but nothing changed. Ooi’s fond memories of racing was the Batu Tiga circuit in Shah Alam. “It was indeed a sad day for motor racing when he circuit was closed for development,” said Ooi with sadness. 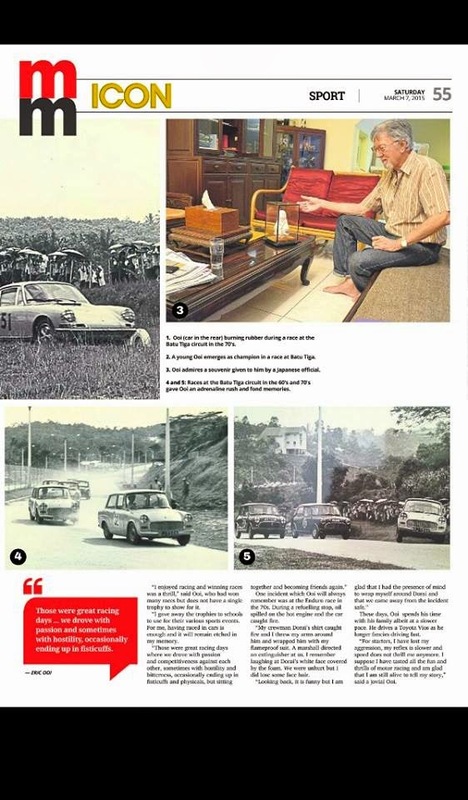 “That circuit produced some of the best motor racers both for cars and motorcyles,” said Ooi himself had powered Malaysian Motor Sports Commission (MMSC) driving Nissans together with Kenny Lee and Lee Kwan Leong to win the first interclub championship in Batu Tiga in 1973. “Anyone could race there because it as affordable. And they had the series production race where one could just race a car with no modifications at all,” said Ooi who was employed by Dunlop then. Ooi singled out YS Khong as one of the talent who surfaced from Batu Tiga and whom he personally took an interest in. Ooi said that motor racing is very expensive these days and it is only for the rich kids. “Those days the mechanics could dream to become top drivers one day. Ooi said that he has only fond memories of his racing days, expect for the 1st Asian Highway Rally. “I just enjoy racing and winning races was a thrill,” said Ooi who had won many races but does not have a single trophy to show. “I gave away the trophies to schools to use for their various sports. For me the memory of having raced is enough and it will forever stay etched in my memory. One incident which Ooi said will always remember was when during the Enduro race in the 70s during race refuelling stop, oil spilled on the hot engine and caught fire. “My crew Dorai’s shirt caught fire and I threw my arms around him and wrapping him with my flameproof suit. A marshall directed an extinguisher at us. I remember laughing at Dorai’s white face covered by the foam. We were unhurt but I did lose some face hair. Ooi these days spends his time with his family in a slower moving lifestyle. He drives a Toyata Vios and said that he longer fancies driving fast. 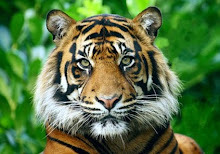 “For starters I have lost my aggression, my reflex is slower and speed does not thrill me anymore. I suppose I have tasted all the fun and thrills of motor racing and am glad that I am still alive to tell my story,” concluded the jovial Ooi.